Kidney beans, cannellini beans and flageolet beans are the three beans in this all natural delicious French meal from St Dalfour. They are mixed with carrots, sweetcorn and lentils in a tasty oil-based dressing to create a complete meal that can be eaten anywhere. It even comes complete with its own fork. Diced carrots (21%), sweetcorn (15%), lentils (13%), green peppers (10%), broad beans (9%), french beans (7%), onions (7%), virgin olive oil (3%), salt, mustard, basil, garlic, thyme, thickeners (xanthan and guar gums). The St Dalfour French Bistro Three Beans & Sweetcorn - 175g product ethics are indicated below. To learn more about these product ethics and to see related products, follow the links below. 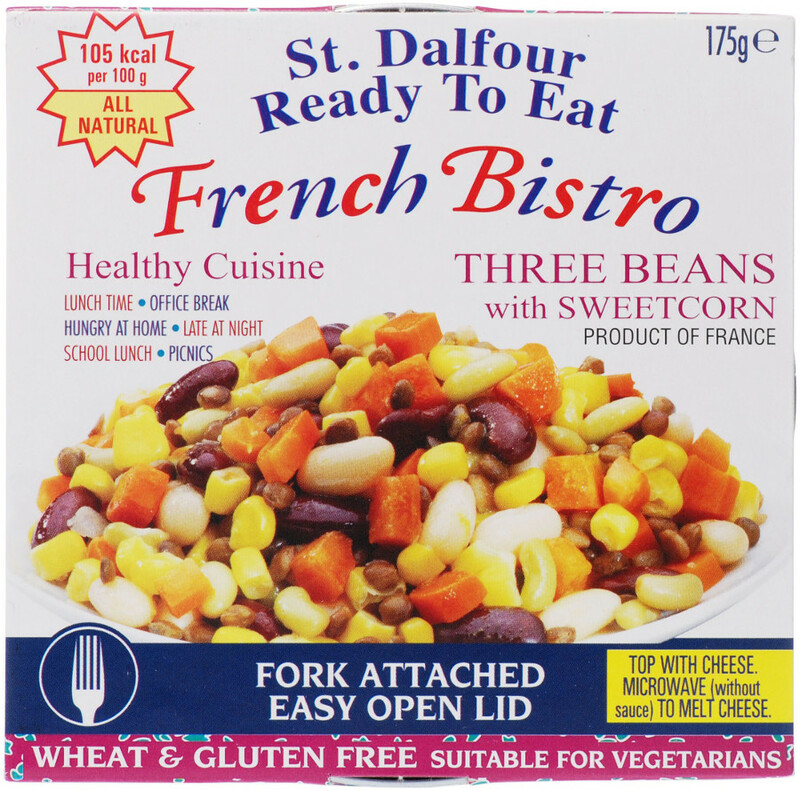 There are currently no questions to display about St Dalfour French Bistro Three Beans & Sweetcorn - 175g. St Dalfour’s French bistro range has been created using the finest ingredients and the attention to culinary detail that is synonymous with French gourmet cuisine. With a philosophy demanding only the freshest and most natural ingredients St Dalfour’s ready to eat range is a delightfully healthy option for a quick snack or light lunch.